Exploded-view drawings printed on each mat…The pistol mat has an exploded view of the Glock 17 printed on it, and the rifle mat has an exploded view of an AR-15 printed on it, allowing you to see each part and the subassembly group it belongs to. 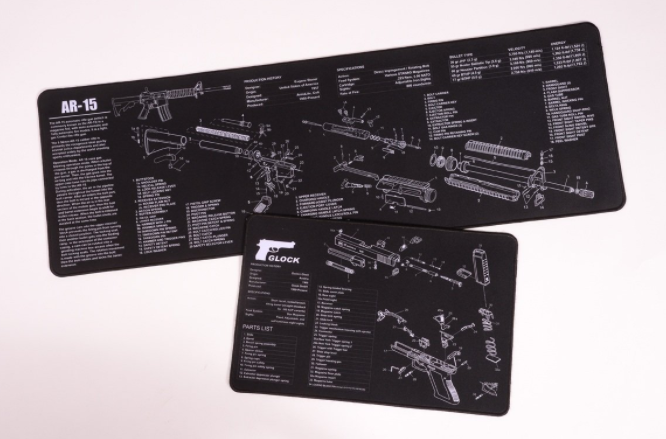 Gun-specific parts lists printed on each mat…Glock 17 pistol and AR-15 rifle parts lists are also printed on their respective mats, giving you the factory name of each part in case something is damaged and you need to replace it. “No snag” top-layer construction… The mats are each made with a soft polyester top layer that won’t snag on your gun or small parts as you disassemble and work on your firearm. Plus, it prevents small parts from rolling off the mat and getting lost, and keeps everything in place until you need it. Thick foam padding… You’ll avoid the scratches that happen when you’re cleaning your gun on hard, abrasive surfaces… the pad protects your gun from damage while you’re working. Protection from oil, solvents, and slippage… Neoprene rubber backing on the pad, grips to the surface under it, keeping your gun-cleaning mat firmly in place while you work. 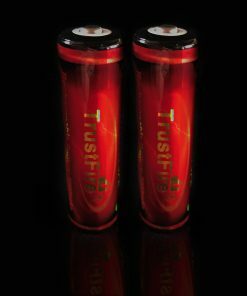 It also prevents oil or solvents from leaking onto the surfaces underneath it, keeping them clean. Machine washable… In the event your gun cleaning mats accumulate a bunch of dirt, chemicals or oil, they’re machine washable. Simply put your mat in the wash on a gentle cycle and then allow it to air dry and it’s like new. Rolls up for easy storage… Your mats are flexible enough to roll up for easy storage when not in use, or to toss them in your range bag or hunting gear so you can give your guns a proper field cleaning. 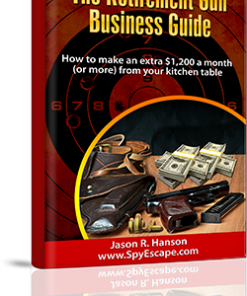 Large work area… The pistol mat is 11×17 inches and the rifle mat is 12×36 inches, giving you a generous working area. You can take your gun completely apart, and have ample room to clean it thoroughly without fear of parts rolling into each other, or falling off the mat.